Sessional Staff provide the majority of the teaching in higher education in Australasia. 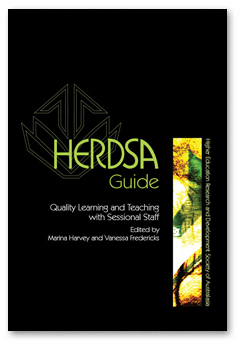 This HERDSA Guide provides advice and practical strategies to assist institutions to work towards systematising good practice for learning and teaching with sessional staff across all institutional levels. Each chapter targets a specific audience, focusing on the subject convenor, department, manager, faculty, institution, and individual sessional teacher. The Guide which draws on more than ten years of research in Australia, provides evidence-based criteria for good practice and good practice strategies supported by authentic case studies, reflective prompts and checklists. This guide will be of use to the many groups within the institution from human resources to deans of faculties as well as sessional staff themselves.